Visit us at booth #109 to see a demo of our MimioFrame touch board kit, MimioSpace ultra-wide collaborative system, and ProColor touch table—the latest additions to our line of whole-class and collaborative solutions. We look forward to seeing you at FETC in Orlando! Take your flat panel even further: With our newest software additions, you can stream up to four devices to your panel and have the ability to control and report on the operation of ProColor displays through one easy-to-use portal via your web browser. ProColor interactive touch table: Work in small groups at an interactive touch table with up to 12 single-point users. Also preview our newest customizable collaborative activities. MimioFrame touch board kit: Turn your existing whiteboards into touch boards with this exciting new retro-fit technology. MimioSpace collaborative system: Have the space for your students to engage with lessons, videos, web pages, and class objectives all at the same time in an interactive, ultra-wide collaborative area that's almost 11 ft wide! MimioStudio™ classroom software: Create interactive lessons, collaborative activities, and perform real-time formative assessment. The new software enhancements allow you to embed web pages and accommodate an even broader range of third-party whiteboard lesson files. 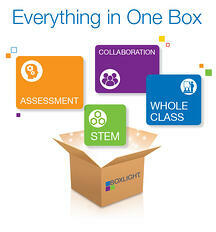 Exciting product previews: Stop by and see sneak peeks of our latest solutions previewing only at FETC! I welcome the opportunity to show you the exciting new Boxlight classroom, better understand your instructional needs, and work with you to determine which solutions will best fit your educational environment, curriculum, current technology setup, and budget. I look forward to seeing you at FETC 2019! Schedule a personal demo to experience the Boxlight classroom.